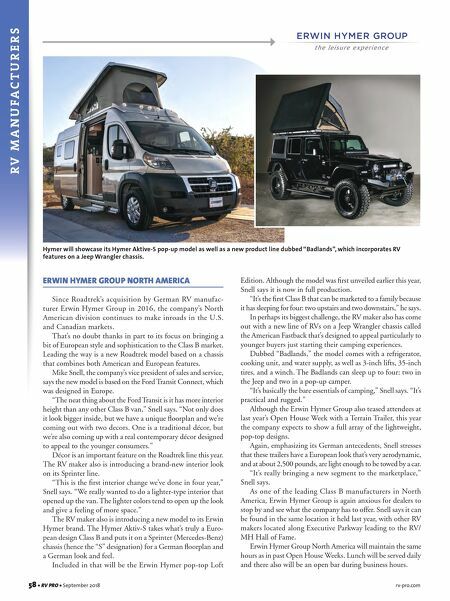 58 • RV PRO • September 2018 rv-pro.com R V M A N U F A C T U R E R S ERWIN HYMER GROUP NORTH AMERICA Since Roadtrek's acquisition by German RV manufac- turer Erwin Hymer Group in 2016, the company's North American division continues to make inroads in the U.S. and Canadian markets. That's no doubt thanks in part to its focus on bringing a bit of European style and sophistication to the Class B market. Leading the way is a new Roadtrek model based on a chassis that combines both American and European features. 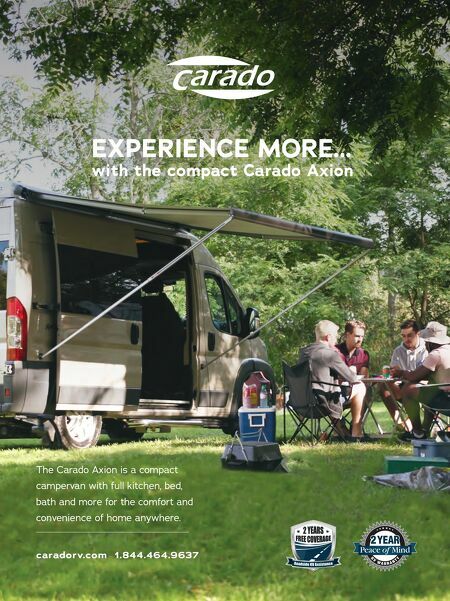 Mike Snell, the company's vice president of sales and service, says the new model is based on the Ford Transit Connect, which was designed in Europe. "The neat thing about the Ford Transit is it has more interior height than any other Class B van," Snell says. "Not only does it look bigger inside, but we have a unique floorplan and we're coming out with two decors. One is a traditional décor, but we're also coming up with a real contemporary décor designed to appeal to the younger consumers." Décor is an important feature on the Roadtrek line this year. The RV maker also is introducing a brand-new interior look on its Sprinter line. "This is the first interior change we've done in four year," Snell says. "We really wanted to do a lighter-type interior that opened up the van. The lighter colors tend to open up the look and give a feeling of more space." The RV maker also is introducing a new model to its Erwin Hymer brand. The Hymer Aktiv-S takes what's truly a Euro- pean design Class B and puts it on a Sprinter (Mercedes-Benz) chassis (hence the "S" designation) for a German floorplan and a German look and feel. Included in that will be the Erwin Hymer pop-top Loft Edition. Although the model was first unveiled earlier this year, Snell says it is now in full production. "It's the first Class B that can be marketed to a family because it has sleeping for four: two upstairs and two downstairs," he says. In perhaps its biggest challenge, the RV maker also has come out with a new line of RVs on a Jeep Wrangler chassis called the American Fastback that's designed to appeal particularly to younger buyers just starting their camping experiences. Dubbed "Badlands," the model comes with a refrigerator, cooking unit, and water supply, as well as 3-inch lifts, 35-inch tires, and a winch. The Badlands can sleep up to four: two in the Jeep and two in a pop-up camper. "It's basically the bare essentials of camping," Snell says. "It's practical and rugged." Although the Erwin Hymer Group also teased attendees at last year's Open House Week with a Terrain Trailer, this year the company expects to show a full array of the lightweight, pop-top designs. Again, emphasizing its German antecedents, Snell stresses that these trailers have a European look that's very aerodynamic, and at about 2,500 pounds, are light enough to be towed by a car. "It's really bringing a new segment to the marketplace," Snell says. As one of the leading Class B manufacturers in North America, Erwin Hymer Group is again anxious for dealers to stop by and see what the company has to offer. Snell says it can be found in the same location it held last year, with other RV makers located along Executive Parkway leading to the RV/ MH Hall of Fame. Erwin Hymer Group North America will maintain the same hours as in past Open House Weeks. Lunch will be served daily and there also will be an open bar during business hours. Hymer will showcase its Hymer Aktive-S pop-up model as well as a new product line dubbed "Badlands", which incorporates RV features on a Jeep Wrangler chassis.